The foundations of our society are crumbling. Wealthy commentators focused on the beltway are gloating that Trump is in trouble, while Trump’s base is itching for a national emergency, and suicides everywhere are through the roof. Whole species are going extinct and too many progressives accept the frame that migrants are our enemy, not the fossil fuel companies killing our planet for profit. Federal employees are calling out sick instead of working without pay, more teachers are preparing to strike, and General Motors workers and students are coming together to fight for green jobs. I visited the offices of newly sworn-in democratic socialist Congresswomen Alexandria Ocasio-Cortez and Rashida Tlaib last week, something I couldn’t have imagined a few years go. And 150 million Indians launched a two day general strike against far-right Prime minister Narendra Modi’s anti-worker policies. As we look to a new year in the struggle, even (or especially) when the dangers feel overwhelming, let’s remember how far we have come. You and I are part of a 56,000 member strong democratic socialist movement, no, one millions strong across the globe, fighting to transform this world into one for the many, not the few. For all our growing pains as we grew from 7,000 members two years ago, DSA has already taken our place in changing history. Let’s help finish the job. The labor of national staff is often unseen, but critical to support your organizing. I’m adding a new feature to the Dispatch so you can get to know the faces behind the emails. Hey y’all! 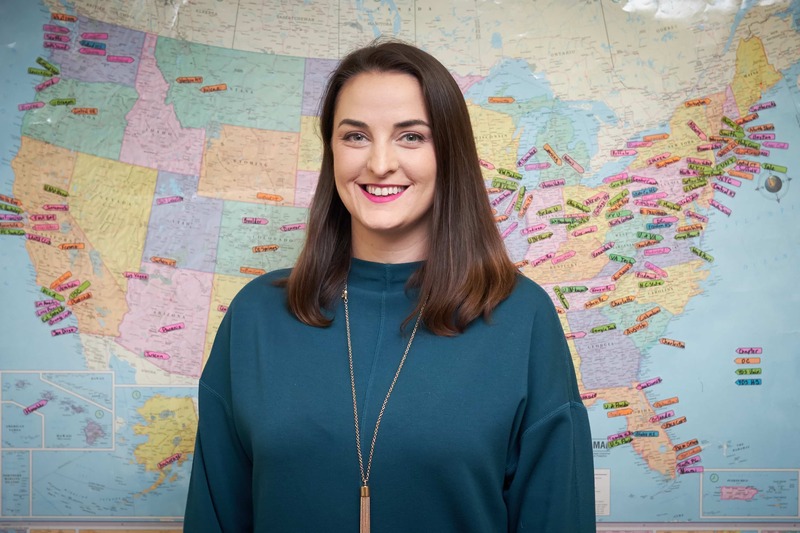 I’m Amy, newly hired Field Organizer for TX, NM, AZ, NV, CO, OK, KS, NE, MO, IA, IN, IL, WI, MN, SD, and ND. In 2015, I walked into a meeting for Houstonians for Bernie. There were 7-8 people. When we did introductions I said, “I’m Amy, and I’m a Socialist.” Some of the organizers later asked me to join DSA. They had been members for years, but said my enthusiasm about socialism made them ready to organize. At the time, I didn’t see myself as an activist, much less an organizer. Before I knew it, I was elected as co-chair and soon found myself working full time for my union. When not organizing, I dote on my cattle dog and his westie mix brother and enjoy finding cheap foodie spots with my comrades. I feel so lucky to have the opportunity to grow so tremendously with DSA, and look forward to growing together with y’all now that I’m on staff! Hello fellow organizers. I interact with people from across DSA every day but realize that many of you probably don’t know who I am. 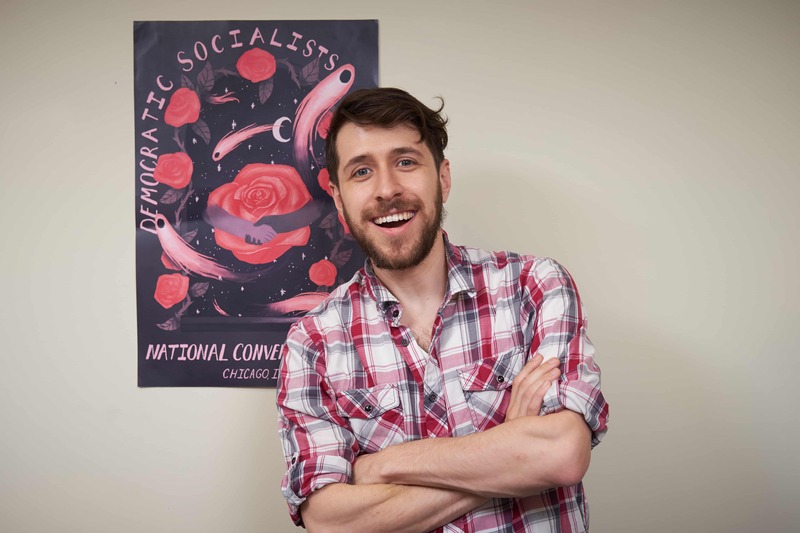 My name is Lawrence Dreyfuss, pronouns He/Him, and I am a Program Associate on DSA’s national staff. Prior to working at DSA I was a high school teacher in a Native Hawaiian community on Oahu, co-managed an arts venue in downtown Los Angeles, and most recently was creating politically responsive art in New York City. Today, I do everything from manage DSA’s external communications, coordinate national working groups, and run the national swag store. If you’ve ever bought a DSA Abolish Ice shirt or been on a national webinar, I was working behind the scenes to make that process as smooth as possible. I never cease to be inspired every day by the amazing work of members. I truly believe we are on a path to building a better future. TWO: Who is Your Field Organizer? To ensure support for every chapter and with the changes in the Field Organizer team, we’ve slightly adjusted the Districts and Field Organizer assignments. Click here to see the list of states and Field Organizers. This president’s day weekend, youth organizers from across the country will gather in the San Francisco Bay Area February 15-17 for the 2019 Winter Conference: Class Struggle in Session, with panels, workshops and socializing. We’ll talk about YDSA’s biggest projects, including College for All and building student-worker solidarity, and provide unique and in-depth trainings on organizing and leadership skills. Attend if you are a youth or student! Donate to the Winter Conference fund if you are not a student, to provide travel scholarships to students traveling long distance to get to the conference. Since the Southern Tour was such a success, we’re launching another Medicare for All tour with Sanders Institute fellow and single-payer champion Michael Lighty. And just in time! Democrats are feeling the heat to respond to the public’s demand for Medicare for All. They’ve promised to hold committee hearings on the policy, and it seems like a CBO report on single-payer healthcare is on its way. Importantly, Rep. Pramila Jayapal is planning on releasing an updated Medicare for All bill in the House imminently. But with powerful donors lined up in opposition and prominent Democrats either cagily supporting Medicare for All or actively attempting to undermine it with copycat legislation, it’s clear that we cannot trust the Democrats to give the people what we overwhelmingly demand. The East Coast tour launches January 26 in Philadelphia with Michael Lighty and CWA District 2-13 Vice President Ed Mooney. Watch the Medicare for All page for future tour stops. Medicare for All is even better than we thought, but we have our work cut out for us. If you have friends, family members or colleagues who are interested in keeping up with the campaign, tell them to sign up here to receive the Medicare for All newsletter, All In, straight to their inbox. The National Electoral Committee is excited to announce the endorsements of Chicago Alderman candidates Byron Sigcho Lopez, Carlos Ramirez-Rosa, Rossana Rodriguez-Sanchez, and Ugo Okere, running in the primary elections this February 26th, 2019. They are also excited to announce the endorsement of Megan Green, running for president of the St. Louis Board of Aldermen this March 5th. Please step up to support these candidates and help them expand democratic socialism in the Midwest! For all chapters seeking a National endorsement of their locally endorsed campaign, the deadline to apply is 90 days before your election date and your chapter can apply here. The NPC is elected at the national convention every two years and is the highest decision making body between conventions. The next meeting will be January 26–27 in Philadelphia. We’ll send out info on how to sign up to watch it on livestream prior to the meeting. The Steering Committee of the NPC also voted recently to begin posting minutes of Steering Committee meetings on the members-only Discussion Board. It’s a little daunting to be organizing NINE regional conferences this spring in a span of three months, even with the support of the fabulous host chapters. We haven’t done this before. But it’s also very exciting. We live in dangerous times, but the opportunity to build a new world is here if we take it. That means building power to confront the capitalist class in our home communities, but also coming together across chapters and states to think about the big picture and long term. Regional pre-convention conferences will be part of a participatory convention preparation process all spring and summer for members, also including Zoom calls and in-chapter discussions. We are starting the registration process with chapters, and will soon open it up to at-large members including organizing committees as well. Click here to see an FAQ. We are sorry that the year-end fundraising appeal mailing did not have a union bug on it. Although all of it was union-printed, and we requested the bug from the printer, they accidentally omitted it. We should have double-checked, and we apologize for the error. The envelopes were manufactured and printed by AFL-CIO Local 298 members. The mailhouse labor (letters printed, folded, inserted, envelopes stuffed, sealed and addressed) was by UFCW Local 888 members. As a reminder, please make sure all your chapter printing, swag, and banners, is done by union labor and includes the union bug. And double check that the bug is there before you accept the final product!